The other day, I showed off how I made over my daughter’s front porch. 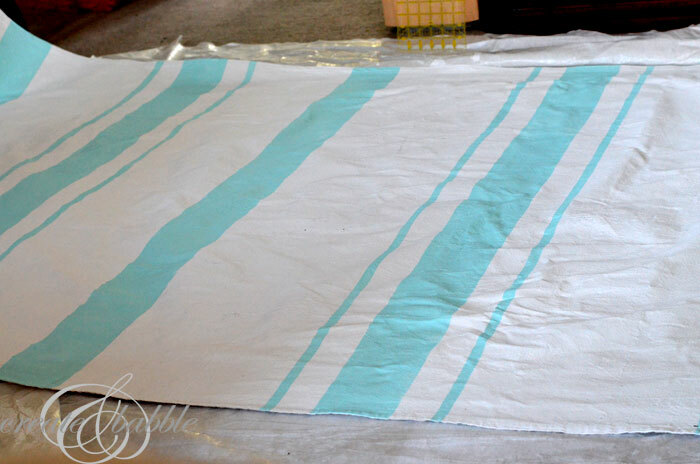 Today I’m going to show you how I made the painted canvas floor cloth. This is so easy! 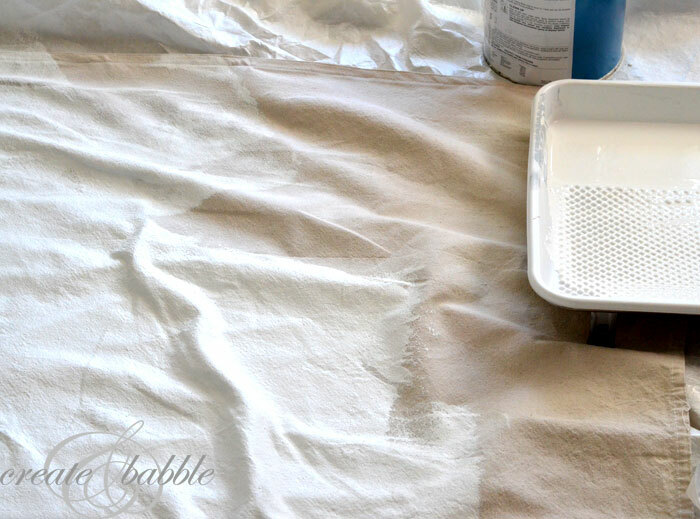 Step 1 – Machine wash and dry the canvas drop cloth. Step 4 – After the coat of primer is dry, tape off the canvas for stripes. I was going for a grain sack kinda look, so I made thin and thick stripes. 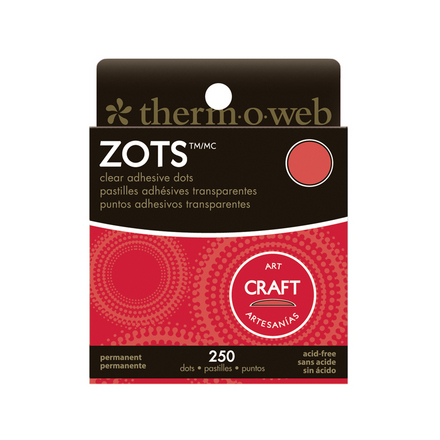 Step 6 – Remove painters tape and ooh and ahh at your lovely, almost-done floor cloth. Step 7 – After the paint is completely dry, apply several coats of the Polycrylic. Follow the instructions on the can for drying times. I used a spray can which was enough for three coats. The Polycrylic gives the cloth a nice, hard finish that enables you to sweep or hose off the floor cloth. That’s it! 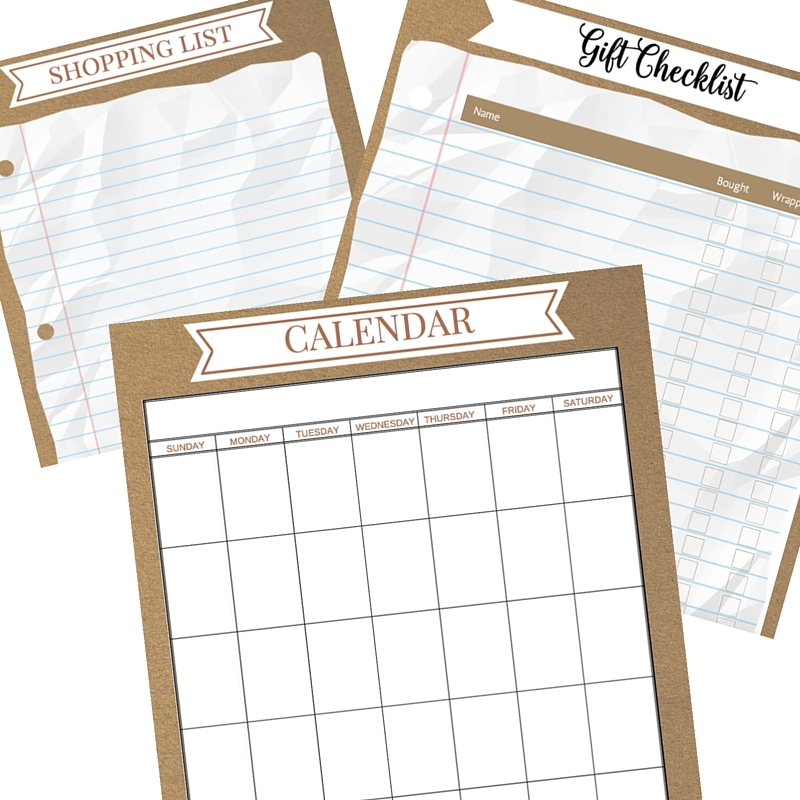 This is a really easy project and one I want to do again soon. I’ve been looking for a runner for my hall and the rugs I like are so expensive. Hmmm. Linking to these great parties. It looks awesome! Was this just a regular drop cloth? Thanks Maureen, and yes, just a regular canvas drop cloth! This is really fabulous – thanks for the tip about the polycylic. Now it makes sense how it becomes a rug… I was worried it would still feel too ‘fabricy’ and move around too much?? I guess inside the house you would want to put down a mat underneath to keep it in place. I absolutely love the grain sack look – want to try this soon. Am pinning it!! Thanks Krista….and you’re welcome! : ) I am definitely going to make one for my deck. It doesn’t move around at all on the porch, probably because the porch is cement and it kind of grips the canvas. The polycrylic makes it cleanable. When we were working on the porch, debris was all over it and we just swept it off with a broom and it can be hosed off, too. For indoors, I have read to put a mat under it to keep it in place. Thank you so much for pinning! I was just over at your blog (I love it!) and I do believe we think a lot alike! You have a new follower! 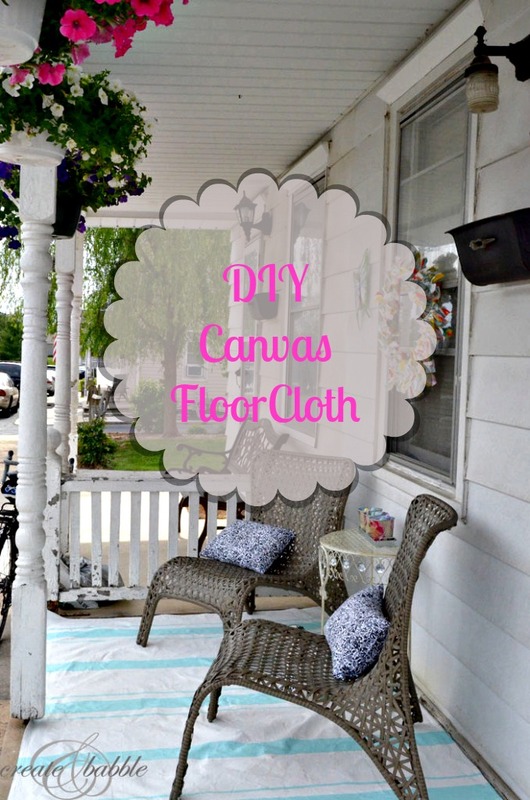 Making the rug with a drop cloth is so much less expensive than buying the canvas. Really loving how yours looks on your front porch. Seems like one could be made and used pretty much anywhere. You did such a great job on yours, love the grain sack look. I’ve wanted to make a rug for long time but the cost of the canvas was tremendously off putting. Can hardly wait to get myself a smaller drop cloth so I can try this. I’d like to make a rug for our kitchen/mud room floors for winter. It’s very cold in winter, can feel the cold underfoot as we have ceramic tile floors, brrrrr. I have to wear thick socks and ugg boots. We live in Western CO and we have a mfg. home with no foundation, this last winter was big chiller. 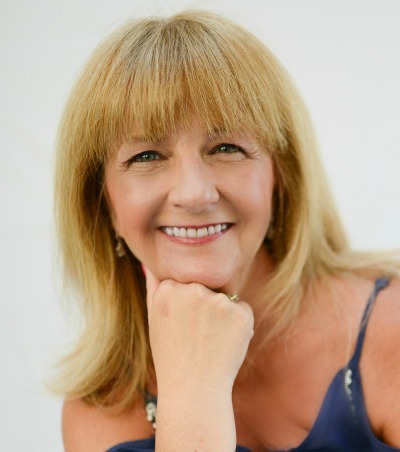 So glad I found your post on the blog thru Life on Lakeshore Drive. Thank you so much! I found that the drop cloths at Lowes were less expensive than anywhere else. This is so cool! I love that blue teal color, it’s one of my favorite colors! I need to try this very soon! I’m your newest follower on Bloglovin! Thanks Selene. I’d love to see your rug when it’s done. I will follow you back! I love the idea and have often wondered how to make one of these, thank you so much for sharing! I have a rectangular patio table, it would look so nice under it and the table would keep it from blowing away! Thank you Terri and thank you for sharing on your FB page! If make one, I’d love to see a photo of it! This is fantastic Jeanie! I have been looking for an area rug for my screen porch! I think this would be a perfect idea. Now, I just have to decide on a pattern! Thanks Maureen! Let me know if you make one. I’ll want to see a photo! I, too, am wanting to jump on the bandwagon with this rug. One would look so cute under our patio swing. And since I’m heading over to our local lumber/hardware store today I’m picking up supplies for it. Thanks for the idea and good instructions.